how can I export game to any other format then blender ( i mean exe or shockwave etc… something where people dont need to install blender)? i make a simple game with rigged character, he can walk in a small village, but when I save runtime (and add needed libraries) it does not work, there is mess with character vertices, and vertices are everywhere (no nice working character like in blender when i use P key). can this be solved? Goto the File Menu, it’s “Save Runtime”. If you do this on a windows machine, you get an exe - likewise the Mac & Linux variants, not an exe, but an executable program all the same. On windows, you need zlib.dll & something else in the same folder as the exe for it to work. This might fix it for you, please do it to a test file, not your original. 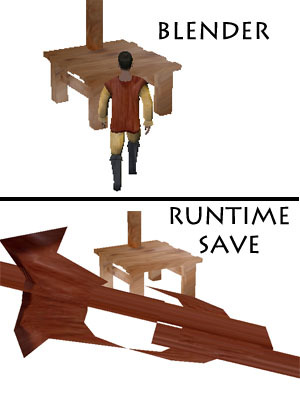 is possible that game engine does not supports inverse kinematics? if yes, why it works in blender and not in export as runtime ? it seems like some bug. it makes 2.44 and 2.45 too.